The design of this glass sip'n straw cup is outstanding. The temperered glass on the inside is protected all around by a polypropylene plastic shield that protects the glass inside. The Green Sprouts Sip'n Straw cup can be used with the provided silicone sip spout (great for ages 6-12 months) or can be used as a kids glass straw cup (great for ages 6 months plus). The liquids in the cup only touch glass and silicone. The outer plastic protective cover does not come in contact with the liquids inside the cup. tempered glass insert that holds 4oz. The Glass Sip & Straw Cup allows baby to safely handle a glass cup independently. Liquids only touch glass and silicone on the inside, while the outer plastic shell protects from breakage. 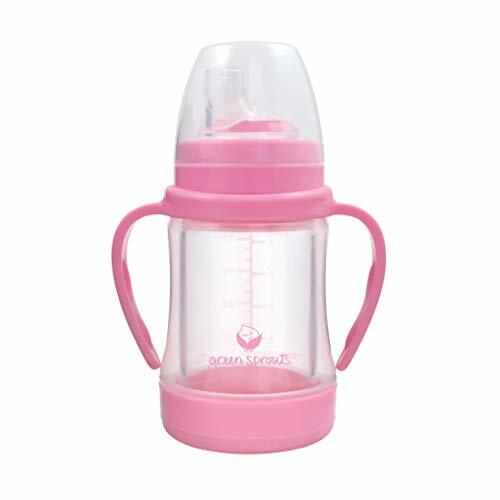 A silicone sippy and straw spout are included for extended use and to grow with baby. Parents and babies love the Glass Sip & Straw Cup because it is safer from the inside out.